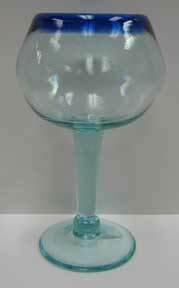 Household glassware was unknown to pre-conquest Mexicans. The first primitive Mexican glassware was produced in Puebla in 1542. For hundreds of years, with nothing more than a blob of molten glass, a long hollow pipe, and a few primitive tools, these artisans have produced glass items in a variety of shapes. Originally, Mexican glass was called bubble glass because of all the bubbles produced when methods were not as uniform as today. The blown glass technique consists of blowing through a pipe onto a red-hot glass mass, heated in a special oven. As the artisan blows, he can start molding the piece by turning it around with the pipe. When the piece starts cooling, using the appropriate tools, any figures can be molded. Color is added to the glass to give it a wonderful look, tones and effects. Some very experienced artisans add effect such as small bubbles in the inside of some pieces. Base Diameter 5.5", Height 11"